In late July 1976, a devastating earthquake flattened the city of Tangshan—and violently shook the Bejing sickbed of Mao Zedong. In China, nature’s signs have been traditionally understood to foreshadow political events, and a severe earthquake indicated the end of a dynasty and its mandate to rule. Sure enough, on September 9th, Mao died. The “King’s Two Bodies,” a concept invoked in Europe to ease the difficulties of dynastic succession, did not apply to China after Mao. When news that “Chairman Mao has left this world” was announced sixteen hours after he had passed away, some wept, others were stunned. Mao had been China’s leader for longer than anyone had ever led a major nation in modern times. Hundreds of millions of Chinese had no memory of a China without him. Despite widespread dismay at his recent politics, Mao was difficult to deny. How, then, do we explain what happened just before and just after Mao Zedong’s death? Did he actually pass on to his designated successor Hua Guofeng that famous note: “With you in charge, I am at ease”? 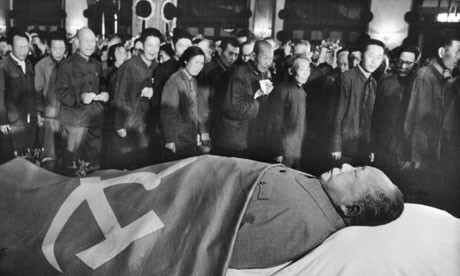 Why Mao’s body not cremated, as he had requested, but instead mummified and entombed in a newly-built mausoleum? How did this process lay the groundwork for the repeated and continuous resurrections of Mao, who has lived on in pop-songs, on bank notes, and in temples in the decades following his death? Historian Barbara Mittler will focus on these questions in her discussion of Mao’s posthumous legacy. Prof. Dr. Barbara Mittler is Professor of Chinese Studies at the Institute of Chinese Studies at the University of Heidelberg. Her hundreds of publications include the books Dangerous Tunes: The Politics of Chinese Music in Hong Kong, Taiwan, and the People’s Republic of China since 1949 (Harrassowitz, 1997); A Newspaper for China: Power, Identity and Change in Shanghai’s News Media (1872-1912) (Harvard, 2004); and A Continuous Revolution: Making Sense of Cultural Revolution Culture (Harvard, 2012), which won the 2013 John K. Fairbank Prize from the American Historical Association. She is a graduate of Heidelberg (Ph.D.), Oxford (B.A./M.A. ), and Pearson College (I.B.) in Victoria, B.C. This event is held in conjunction with the 2017 Yip So Man Wat Memorial Lecture, featuring speaker Prof. Dr. Barbara Mittler (University of Heidelberg), hosted by the UBC Department of Asian Studies.